The​ Philadelphia Flyers dropped a bomb​ on​ Monday,​ announcing​ that​ GM​ Ron Hextall​ had been fired​ midway through his​ fifth​ season on the​​ job. The move comes as a shock, partly because of Hextall’s long history with the franchise and partly because many figured that coach Dave Hakstol would be the first to go. But there’s another reason the Hextall firing caught so many of us off guard: It’s extremely rare to see a team change its GM midway through a season. Putting a roster together is a big job, one that’s even harder to do when you don’t start until late November. Teams almost always prefer to let a new GM come in early in the offseason, with time to organize the front office, run the draft, and come up with a strategy for free agency and the salary cap. Changing coaches midway through a season often works out well, as we broke down last week. But GMs? That’s a whole different scenario. Still, it does happen, including last season’s demotion of Ron Francis in Carolina. As we work through the fallout of the Hextall news, let’s take a look back at ten times in modern NHL history that a team has changed GMs during the regular season. This isn’t meant to be an exhaustive list, but we’ll try to pick out examples that demonstrate both the good and the bad of this sort of move. The old GM: One month into the lockout-shortened 2013 season, with the Blue Jackets having lost eight of their last ten, Columbus fired GM Scott Howson. The move came just months after he’d pulled off the biggest trade in franchise history, sending an unhappy Rick Nash to the Rangers. The new GM: The team turned to Jarmo Kekalainen, making him the first European GM in NHL history. How it worked out: Reasonably well, even as some observers thought Howson got a raw deal. (He memorably received two votes in GM of the Year balloting despite being unemployed.) Kekalainen remains on the job to this day – along with Bob Murray of the Ducks*, he’s the only current GM who was a midseason hire – and has built the Blue Jackets into Cup contenders. The old GM: We may never see another GM like Harry Sinden, who’d been on the job for 28 years when he finally stepped down in November 2000. He remained on as president, a role he’d hold until 2006, but the Bruins would have a new GM for the first time since the days of Bobby Orr and Phil Esposito. The new GM: Mike O’Connell took on the dubious job of replacing a franchise icon. 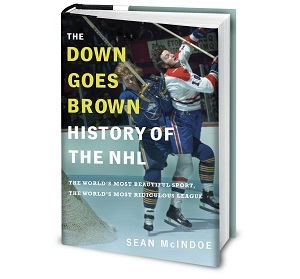 How it worked out: The Bruins were well into rebuilding mode – this move came a few months after they’d traded Ray Bourque to the Avalanche – but O’Connell got them back to the playoffs by 2002, winning the Northeast Division in the process. But he never won a playoff round and was fired at the end of the 2005-06 season. Fairly or not, he’s probably best remembered for being the only GM in North American pro sports history to trade a player in the middle of a season in which he won MVP. The old GM: Darcy Regier, who’d been on the job since 1997 and had led the team to the Stanley Cup final in 1999. But after a 4-15-1 start and with Buffalo fans chanting “Fire Darcy” at home games, a move seemed inevitable. It was. The new GM: This is where things get a bit weird. The Sabres didn’t immediately name a new GM, but did appoint Pat LaFontaine as the president of hockey operations and Regier’s de facto replacement. LaFontaine eventually hired Tim Murray away from the Senators in January, in a move that was widely applauded. But by March LaFontaine was gone too, resigning amid reports of an “ugly” conflict with Murray over player personnel decisions. How it worked out: Murray initially seemed like a great hire; he did well on the Ryan Miller trade, and did the dirty work to prepare the Sabres for the 2014-15 tank job that landed them Jack Eichel. But he couldn’t turn the team around once they’d hit rock bottom and was fired as part of yet another Sabres housecleaning in 2017.